An oil drain pan is a significant tool to use in both a home garage, and also in a professional shop. For those who have never had a waste oil drain pan with an attached pump, but rather just let engine oil drain into a bucket by gravity, they may not see an immediate need for one. But when it’s time to change your vehicle’s oil, you’ll be glad you have one. 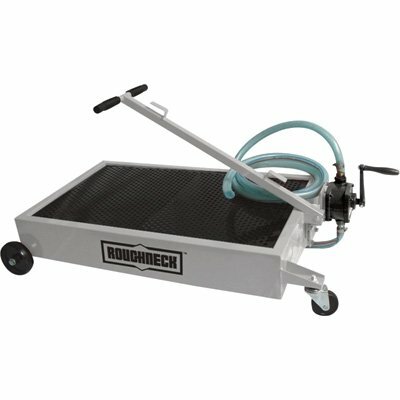 What Is An Oil Drain Pan With An Attached Pump? 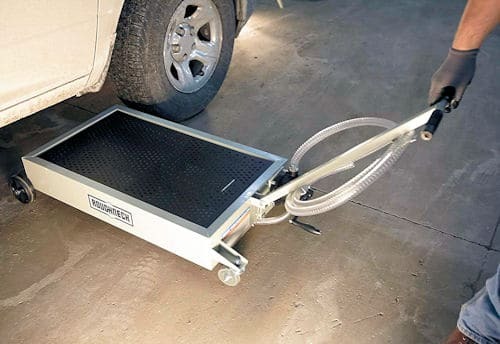 A waste oil drain pan is the device that is used to collect fluid from underneath vehicles, including big trucks and tractors, all without having to use a jack. When you add a pump to an oil drain pan, it means you can force the collected liquid from the vehicle you were working on out of the device and into a collection point. This makes it is easier and cleaner to drain said liquid from your oil drain pan. Our top choice in this roundup of the best portable oil drain pans with pumps is STKUSA 17-Gallon Pan. The STKUSA unit is made from polypropylene, which serves the dual purpose of making the pan both tough and lightweight. 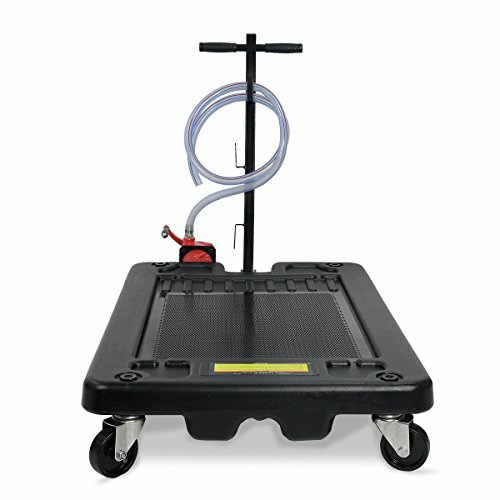 Given that motor oil weighs a little over 7 pounds, and the STKUSA pan can hold 17 gallons, that means this rolling pan can be called on to carry a 120-pound payload. So strong and lightweight are great features in a portable oil pan. This pan also boasts a folding handle for easy storage, and a 7-foot long hose for evacuating the oil. That hose attaches to a manual crank pump that will allow you to move the waste oil out of the pan and into a storage container without having to dump, spill, and then wipe up mess. A survey of online reviews of the STKUSA oil drain pan were all positive, with every respondent giving the unit either 4 or 5 stars. 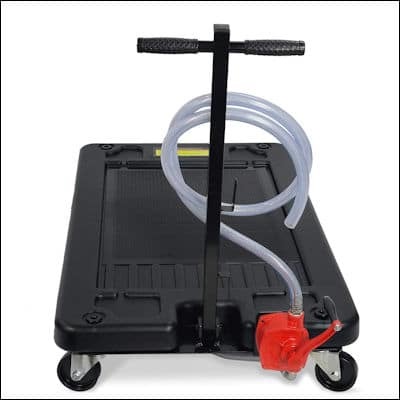 And since it comes at a great price, the STKUSA 17 Gallon Portable Oil Drain Pan won our top pick. 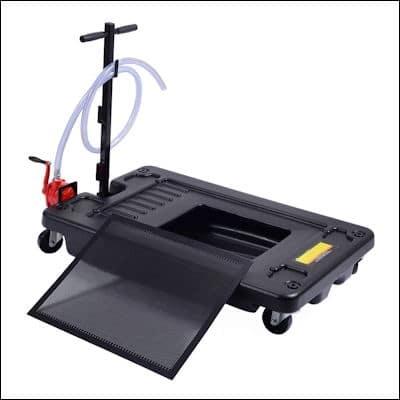 Our second choice for best low profile oil drain pan with pump is this unit from Generic. For all intents and purposes this pan is a generic version of our number 1 choice from STKUSA, so it makes sense that it should rank similarly in our review. It comes with the same capacity as our top pick, as well as the same evacuation hose length. It also has a folding T handle for convenience, and rolling castor wheels, so it performs basically the same as the STKUSA model. Given the similarity, the only real difference is the price. Typically with a generic brand you would expect a lower price, but this pan came in as costing a few dollars more than the STKUSA model, which is why it ended up at #2. But we still think it is a great value, and worth your consideration. Our third choice goes to the Roughneck Low-Profile Oil Drain Dolly. Unlike the first two pans in our review that are made from polypropylene, the Roughneck unit is made from steel. Give the weight of 15 gallons of oil, a heavy-duty pan is desirable. But while steel is incredibly strong, it also brings with it a few down sides. One is weight – a metal body makes for a heavier pan. The second is construction methods – a steel body means the attachment points for the castors must be welded on to the main body. A few reviewers mentioned weld quality as a concern, so keep that in mind. The Roughneck pan comes with 3″ front swivel castor wheels, and 5″ fixed rear wheels for positioning the pan. And it has an 8′ evacuation hose attached to a hand pump that quickly drains oil, and also a mesh grate designed to catch any metal particulate that might drop while you are draining your vehicle. Overall, the Roughneck is a solid entry at a good price. If you think a steel pan is the best choice for your shop it is worth a look. The fourth choice in our roundup of the top oil drain pans with pumps is the STF-15GS from Shop Tuff. Like our #3 pick the STF-15GS is constructed from heavy-duty steel with a powder-coat finish and features a 15-gallon pan capacity, making it perfect for large jobs. 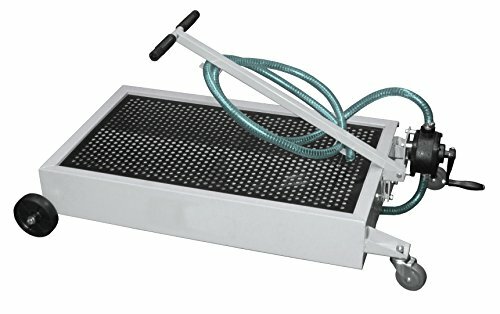 The Shop Tuff pan is designed to prevent parts and other debris from falling into your waste oil by means of a mesh grate that covers the whole drain pan. And it features an expanded metal cover that will reduce oil splashing while you move it. The 8′ drain hose on the STF-15GS attaches to a manual pump which drains oil, anti-freeze, and other fluids quickly. The pump is rated for 0.2 liters per hand revolution, so you won’t spend all day working a crank every time you do an oil change. Due to the steel construction the same concerns about weld quality and eventual corrosion apply to the STF-15GS. But overall it seems like a quality pan that comes at a fair price. The final entry in our list is the Goplus Portable Oil Drain Pan. The Goplus is an 17-gallon Polypropylene pan, so it has the capacity to handle more than a single oil change before emptying. That is a nice feature if you are using it in something other than a home garage. The Goplus has four 4″ spinning castor wheels and a 29″ folding t-shaped handle, so you can easily position it right where you need it. And the polypropylene is impact resistant, meaning it will hold up to frequent use around the shop. Like the other units in our review the Goplus features a hand-crank pump attached to an 8′ hose to make draining waste oil easy and mess-free. But several online reviewers mentioned problems with the pump, which is why it fell down to the low end of our list. But given that the Goplus is priced significantly less than the other pans in our lineup, it might be the perfect choice for those on a tight budget. 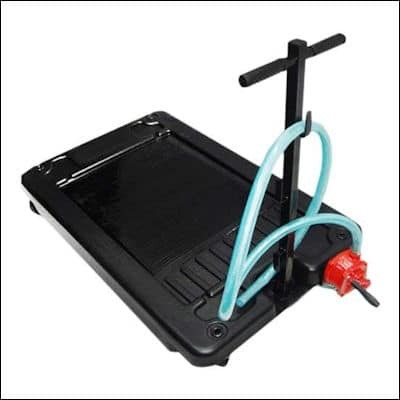 【High Practicability】This oil drain pan is ideal for draining oil or antifreeze where a pit or hoist is not available with a unique no-spill design. It also features with a 8ft hose so that the pan could be applied in multiple occasions. 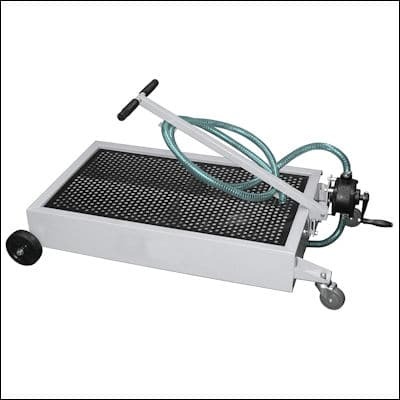 【Heavy-Duty】 This oil drain pan could hold oil up to 17 gallon, which is perfect for large jobs. 【4" Swivel Casters and a Mesh Gate】This oil drain pan features with four 4" swivel casters for easy maneuverability. And the mesh gate could prevent debris and other parts from falling into the oil. 【Durable Tank】The tank is made from high-impact polypropylene, which is lightweight for easy movement yet durable for long-term using. 【T-Handle Folds】Long-reach T-handle makes drain easy to position under vehicles. And it is also great for convenient storage, movement and pulling. Modern vehicles require an oil change at least every 3000-6000 miles, which is pretty often, even if you only have one or two automobiles in your household. If these changes are so common, why should we suddenly use an extra bit of equipment? Here’s why. If you’re working on automobiles without a waste pan and drain the fluid using a tarp-bucket contraption, you may find that the oil will begin spilling out and slowly spread to cover the surface of your workspace – bad news if you’re working inside a garage and have to clear up the spillage. Don’t let this happen to you – spend a little more money in advance to ensure the smooth and easy procedure will not encounter any hiccups along the way. 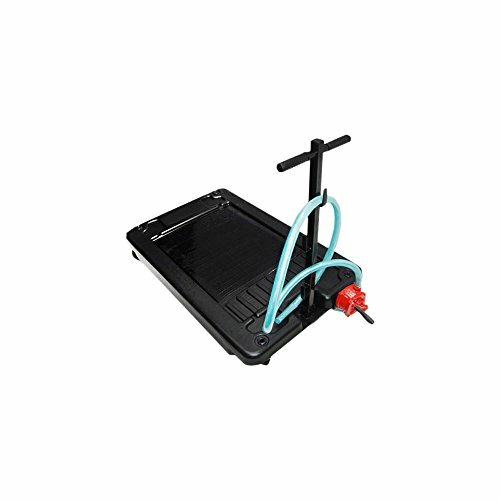 These handy tools are made to collect the fluid from beneath automobiles without requiring the use of a jack or a lift. After using one of these for the first time, you will realize how simply smooth an oil change can truly feel. 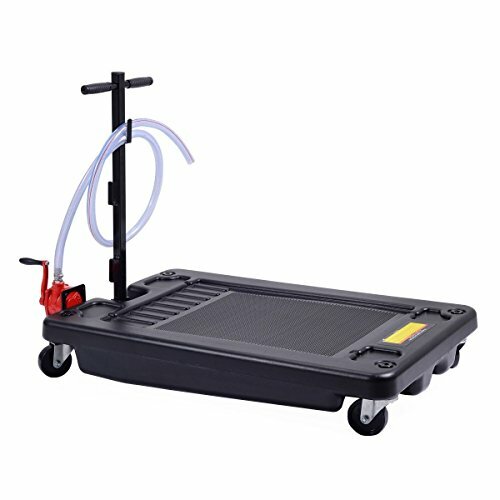 The pump feature allows for easy fluid evacuation and can significantly speed the procedure along. When time is money, all of these little things add up. Vehicle maintenance and upkeep in this department doesn’t have to be crazy expensive. However, you don’t want to compromise performance quality just to save a buck now, because you might end up paying more later. 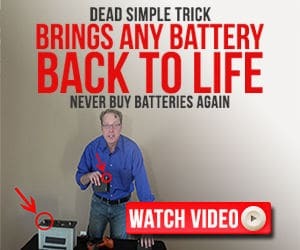 If you’re looking for the best product on the market, you need to start with becoming totally familiar with it, so you are aware of what to look out for. Heavy Duty – You don’t want to be stuck with some flimsy product that will hardly last your first oil change – you need something that is durable and heavy duty enough to withstand a little knocking around throughout its use. A good way to determine the durability is by looking at the material it is made from; a heavier product will most likely last longer and be thicker, however it will be less portable due to the weight. Convenient Size – The size of a waste oil drain pan is important to consider when selecting your next product. The design needs to be large enough to hold the anti-freeze or oil that flows out of your engine during the change, which can vary from car to car. Make sure that the pan size is large enough to hold at least one or two changes before filling up completely, but keep in mind that the ones that hold many changes will be significantly heavier over time. The height of the product should also be factored in, because you need to make sure that it is able to fit beneath the vehicle. For those who are individuals looking to only service a single car or two that belong to their household this becomes a matter of simply finding out both of these measurements, but for those who need one for their professional garage they need something that can accommodate a wide range of cars. Leak Prevention – This feature, along with any others beneficial for this process, is definitely important to consider for your future purchase. Leak prevention features are crucial to your productivity, as even a small spill can hold you up significantly. Not only is it difficult to clean up, and will cause stains, but when spilt on a smooth surface can pose a safety hazard. Handles – Even if you have been doing this for years and have built up all the required strength for the job, the weight of fluids should not be underestimated and can lead to serious self-injury if you aren’t careful. A waste oil pan with handles can make your life immensely easier, so look for an option that seems comfortable to hold. Are Today’s Cars Too Complicated For Home Mechanics? Copyright © 2018, MechanicScout.com. All rights reserved.